Town boss Jamie Fullarton insists his side will be at “full-throttle” to the end of the season as they aim for a hat-trick of wins over Barrow on Saturday. The Shaymen were knocked out of the FA Trophy on Tuesday, losing 1-0 at Solihull Moors, leaving just their National League campaign left to focus on. Halifax are 17th in the table, 14 points adrift of the play-offs and six above the relegation zone. 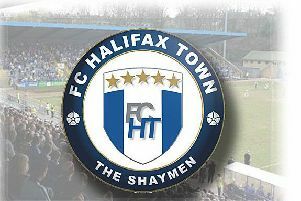 Town beat Barrow 2-0 at The Shay in August, and their 2-1 FA Trophy win last month is one of only two defeats for Barrow in their last 10 games. Boss Ian Evatt, who won the manager of the month award for December, will have new signing Dior Angus, a striker on loan from Port Vale, available. Despite their hopes of any silverware now gone and the play-offs looking out of reach, Fullarton says there will be no chance of Town drifting towards the end of the season. “The environment we have at the club that develops the culture, there’s a personal, professional pride individually and collectively,” he said. “As a manager, you set that culture by the environment you provide. I’m an intense character, and I only know one way, and that’s to drive full-throttle on everything we do. “There’s no need to motivate players because the environment does that. “Every game matters, because every game gives you the opportunity to win three points to get further up the league and get the highest place we can possibly gain. “The individual and collective drivers are there. It’s not a case of drifting along just because the play-offs are a wee bit away and relegation’s not biting us on the backside. “We as a group do not settle for mediocrity, I can assure you of that. Irrelevant of what position you’re in, it’ll make no difference because we’ll be going to win every game. “There’s 54 points available and if we win our game-in-hand that takes us up to 12th or 13th. “What we’re looking to achieve is progression, improvement on and off the pitch. “So we need to be better than 16th (last season’s finish), that’s what we’re looking for. And we need to be higher and better than what our budget is, which we are at the moment. Fullarton has a near full strength squad to choose from, with winger Ben Tomlinson the only short-term absentee and Josh Macdonald the sole long-term injury-victim. “I said we’d have to manage it, be careful, get the reins on. you have to take the responsibility as a manager and say ‘you have to come out of it’,” Fullarton said on Tomlinson. When asked if he was looking up or down the table, Fullarton said: “I don’t look either way. I’m very much focused on looking at what we are, and the next game. “Our focus is on Barrow. Looking at the table isn’t really something I ever do, or I’m aware of. “I group the games, where we’re playing, who we’re playing and what we’re looking to gain over the period, and categorise the games in terms of green, amber and red. Fullarton said the immediate priority is for Town to get to 50 points - generally considered as enough to keep a side safe from relegation. “That’s everybody’s aim from when you start the season - get to 50 points as soon as you can and then finish as high as you can,” he said. “But if you ask any team, they’ll answer the same way. “Having played Barrow twice, we’re looking forward to playing them a third time. Hopefully the wind machine will be off this time! Fullarton said there were plenty of positives for Town to take from their midweek FA Trophy exit at Solihull. “We don’t dress it up because we’re out of the cup, but you have to step back and look at the performance,” he said. “If you’re losing 1-0 and you’ve been bombarded and outplayed, then you have an anxiety where you’re thinking ‘we need to turn this round’. “It’s (about) believing in what we do, and trusting each other. “I think that’s our first defeat in six, and five of those are against top six teams. “It was a fine margin on Tuesday. “We’ve had three performances away from home where we’ve been bitterly disappointing.